Namibia is a country in south-western Africa, on the Atlantic Ocean. The capital is Windhoek. Namibia is an arid country with large tracts of desert. In 2011, 2,113,000 inhabitants lived in Namibia. Between 2001 and 2011 the annual population growth was 1.4%. The official language is English. 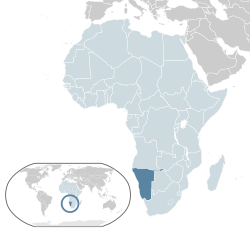 Others languages are various Bantu languages and Koïsan languages, Afrikaans. Namibia was the old German protectorate nammed German South West Africa (1884-1918). In 1920, it was mandated to South Africa by the League of Nations and becamed South-West Africa. South Africa continued to administrate the country after the ending of the United Nations mandat in 1964. South Africa imposed its laws and, from 1948, its apartheid policy. Then began several years of fighting by SWAPO guerrillas. Namibia became fully independent in 1990. This page was last edited on 21 March 2018, at 15:29.